The interaction between a blocking service (ie, one handling http requests, where long-polling might be used to emulate a continuous connection) and a non blocking service (ie, the websocket chat protocol) can be interesting to get right. We’ll reuse the server we finished in Part 2, and have it serve a chat room interface which connects to our server with an http connection, relying on long-polling to emulate a continuous, “real-time” connection. We first add an almost-identical looking event listener to the one in the websocket based chat, to our input box, telling it to send messages when a user presses return/enter. We then define two functions – getData and postData – which handle the actual communication with the chat server. postData is the simpler of the two – it uses functionality defined by jQuery ($.ajax) to build, and then send, a post request to our chat server, with the contents of a message as the only argument. You can read the documentation for that command to learn more about how it does what it does. Note that we labeled sent information as “new_message” – the server-side api component is going to have to unpack that by correctly referring to new_message when it’s received. The “long-polling” component is implemented by setting a function to execute on “complete”, and setting the timeout variable. With a timeout of 1000, we’re instructing jQuery to give the server at least 1 second to respond to our call. If either the server or at least 1 second has gone by, jQuery will terminate the request and call the complete function. This completes the long-polling loop: once every second, we open a server connection asking it “do you have any new messages for me?”, handling any messages as they come. For a production level client, 1 second is probably not appropriate – probably we’d want an exponentially decaying time delay, to be more efficient in network use. For now, this’ll do though. We’re going to perform some delicate bits of surgery on the existing twisted chat server, to add a in a second, blocking, http-based, chat protocol. We’ll also want the two protocols to share data – so that they’ll provide a single set of chat rooms for people to connect to. Let’s break it down some. We’ve added a “messages” structure to ChatFactory(); this structure is going to function as a shared repository for all of the messages we receive over both protocols – to make it possible for users at either protocol to see the same contents for a chat room. Beyond the standard setup, the initialization function (__init__(self)) instantiates a ChatFactory(), and creates a reference to its messages, so that the two protocols now access the same list of messages, and effectively share a chat room. We also have the initialization function start a loop that runs the processDelayedRequests function once a second. This is not strictly necessary for sending out messages – as you’ll see when you read render_GET – but it helps optimize the use of server resources, since, besides sending out messages as quickly as possible after they’re received, it also has the side effect of freeing up resources dedicated to dropped connections. We define a render_POST function. The function name conforms to twisted conventions – twisted will attempt to call a function by this name every time a HTTP POST request comes in. Since we know that only message sends perform posts for now, we assume that we’re receiving a message, and go ahead and process it. First, we add a message to our list of messages. Then, we send the message out to all of the websocket based clients by calling the (soon to be implemented) updateClients method on the first websocket client we can find. Finally, we call processDelayedRequests, to update any waiting httpclients with the new message. We also define a render_GET function. This function responds to requests to new messages. Since the initial request is going to have a lastupdate time of -1 (this is hard-coded in the long_polling.js client), we check if the lastupdate is below 0, and, if it is, we send out a message to let the user know he’s connected, and to request updates at time 0 or higher. We then check to see if there’s any data waiting, which this user should see – the getData function gets the next message that this user should see in his chat room; if there is a message for this user to see, we send it out, together with the time it was received at (so the user knows to ask for the next message in the sequence next time). This creates a request-loop, with the user requesting each message, one by one, until he’s up to date with the chat. Note that in a production application, you’ll probably want to send messages back to the user in batches (since creating/closing http connections is a an inefficient use of network and server resources). Once we’ve run out of messages to send out to the user, we append the request to a list of clients waiting for an update, and use the twisted shorthand NOT_DONE_YET to ensure that the connection is not closed when the render_GET function returns (twisted, by default, closes the http connection if we return any other value from this function). processDelayedRequests performs much the same function as the render_GET function, only it performs it for requests currently waiting for an update. Once a message is sent out, the related connection is closed with a request.finish() function call, and all server resources allocated to it are freed as a side effect of removing it from the delayedRequest list. getData and __format_response are helper functions, which are fairly readable. Note that getData is dynamically creating/instantiating a python object from constructed text (the syntax is a bit weird, but I like being able to do this in python, so I take any excuse to teach people that it’s possible). Once that’s done, in a flurry of keystrokes, open up two browser windows here on one of your long_polling chat rooms, say http://127.0.0.1:8000/long_poll/1, and another two windows on the websocket client for the same window: http://127.0.0.1:8000/chat_room/1 – and chat away! try creating two chat rooms, and posting some messages into each. What happens? Warning: when trying to fix this problem, avoid trying to get the twisted and the Django server to communicate directly. the websocket chat rooms don’t update chat history on disconnect (if you close a window and you open it, you won’t get back-chat history). If you want a fun next exercise, try adding that in! Thus far, we have a very basic UI framework for a non-functional chat system, served by Django. We’ll now implement a chat server, chat client, and api, with the chat functionality being managed and served by Twisted via websockets. #run a TCP server on port 1025, serving the chat protocol. The code above follows one of the twisted code samples/tutorials, implementing a basic telnet chat server, and modifies it to use the web socket protocol and related infrastructure, instead of the basic tcpip one. Note that this example is still using a wrapper around the basic.lineReceiver protocol – nothing too fancy. We need two functions, let’s call them chat.send(), for sending messages out, and chat.onmessage() for handling messages received from the server – the code is fairly readable. We’re also adding an event listener to our input text box, sending out a message each time the user presses return. Make sure you’ve saved the file, and, voila, you should now have a working, very basic, web-socket based chat server. The static/html content served by Django, and a websockets based chat api being served/managed by twisted. Django is smart enough to know to pick up changes to its templates, so all of this should now work, without requiring a restart of the server. Just reload the two windows you have opened on http://127.0.0.1/chats/1 (or go back to http://127.0.0.1/chats/, and open two browser windows on the same chat room) – and enjoy sending messages, in real time, from one window to the next. Next: add a http api for your chat rooms, and a long-polling based client to connect to them. (I make some basic assumptions about the readers of this tutorial). 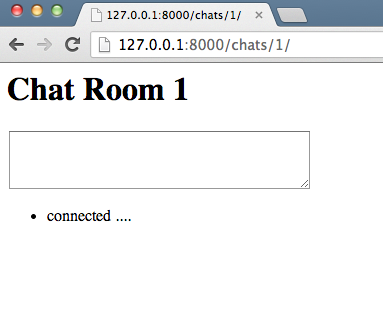 We’re going to be building a very basic chat server on top of Django 1.5, and Twisted 13.1. For this implementation, we’ll be relying on Django, and Django’s html templating facility, to design, build and to serve the ui components for the application. if you haven’t already, it’s probably worth spending a few minutes making sure you have git, pip, virtualenv and virtualenvwrapper installed and working properly, and then set up an environment using Django 1.5.
and then connecting to http://127.0.0.1:8000/. You can check that the server is running – you’ll see a “Welcome to Django” page if it’s running properly. Make sure to save your settings file. Most of this should be familiar from the Django tutorial. The only potential addition is the use of the RedirectView.as_view shorthand. This is a built in shorthand tool for redirecting requests from one url to the other; we’re using it to redirect all requests for http://127.0.0.1 and/or http://127.0.0.1/ to http://127.0.0.1/chats/. We’ll using it here for convenience’s sake – since we’re not going to be serving anything on http://127.0.0.1/ for now, have the server automatically redirect requests to the /chats/ application instead of returning a 404 error. We're building a model for storing a ChatRoom. Note that this specific tutorial doesn't go so far as to store actual chat messages to disk, so we won't need a ChatMessage model (though that model is probably present in the sample code provided at the end of this sequence). That's work for a future followup. This is where the project urls file (django_twisted_chat/urls.py) is going to look for urls (a result of the "url(r'^chats/', include('chat.urls'))" line we wrote in there earlier). Again, this follows the basic pattern taught in the Django tutorial. The convenience method get_object_or_404 may be unfamiliar - it's a shorthand for searching for an element in the database, and automatically returning a 404 not found error if the object is missing (in this case, if someone accidentally tries to access a chat room that doesn't yet exist). log in with the super user that you created, and add a ChatRoom (give it a name and save it). 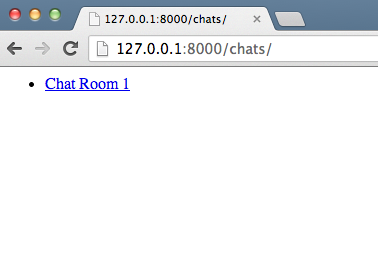 You should automatically be redirected to http://127.0.0.1:8000/chats/, and see a list of existing chat rooms. If you came directly here, you can probably skip to Part 1. I’m assuming a basic competency writing Python code, as well as access to a development environment, editor, and debug/test environment configured for work with Python (with possible extensions for working with Django). If new at working with Python, you can do worse than using Eclipse’s pydev setup, though you’ll be fine working with any text editor. Twisted is a bit harder to get into. For the minimalist, read twisted in 60 seconds, and then take a look at relevant example 1 and example 2, and understand how they work.